Photo on left is a size 4 ladies and on right size 9 ladies and the socks fits both. Spiral tube socks were often knit during the war for soldiers as they have no heel so fit a variety of feet sizes. The purpose of the spiral toe is to allow the sock to be worn in any position. They also wear evenly as the heel can be rotated. The stretchy nature of the spiral pattern makes for a nice fit. 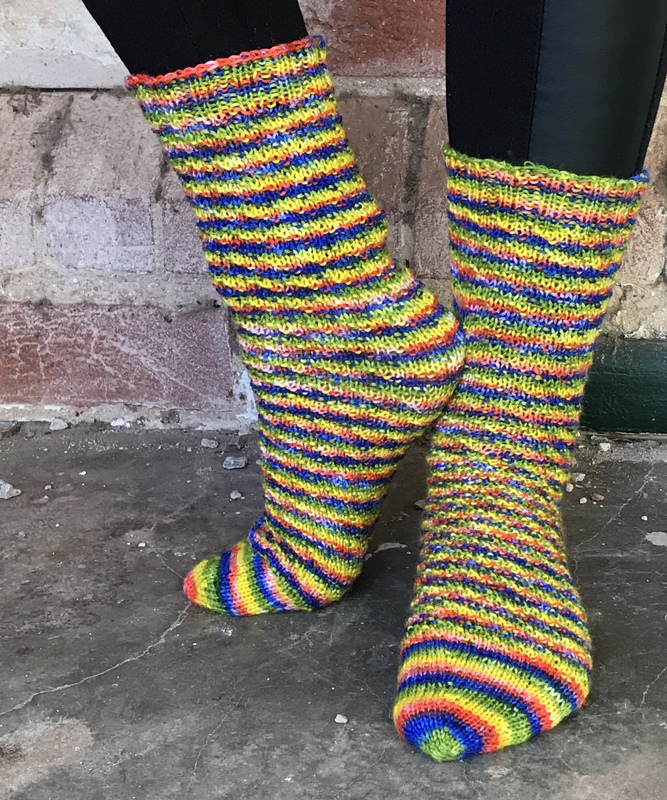 My sock starts with a spiral toe, then is worked in a spiral stitch pattern for the foot and leg and finished with a rib cuff. Work in a spiral *k3,p1 repeat until sock measures desired length. Cast off with a stretchy bind off. I will write up the pattern for an 8 ply version in the near future.